MUMBAI – MAHARASHTRA – INDIA MARCH 08 , 2012 01.15 A.M. 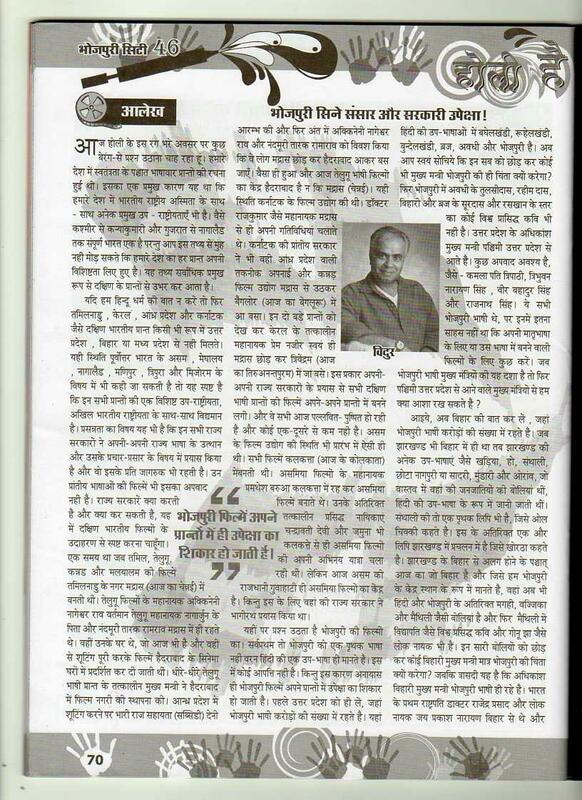 This is the 9th article of my Hindi column ” Kal Aur Aaj ” in Bhojpuri City . It is a Bhojpuri trade magazine being published from Mumbai every fortnight . 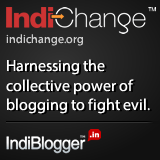 This article deals with the difficulties being faced by the Bhojpuri film industry and the root causes of the Bhojpuri Film Industry‘s current woeful situation . It is sad that Bhojpuri is spoken by almost 22 / 24 crore people living in various parts of the world still Bhojpuri film industry is yet to get its due respect . 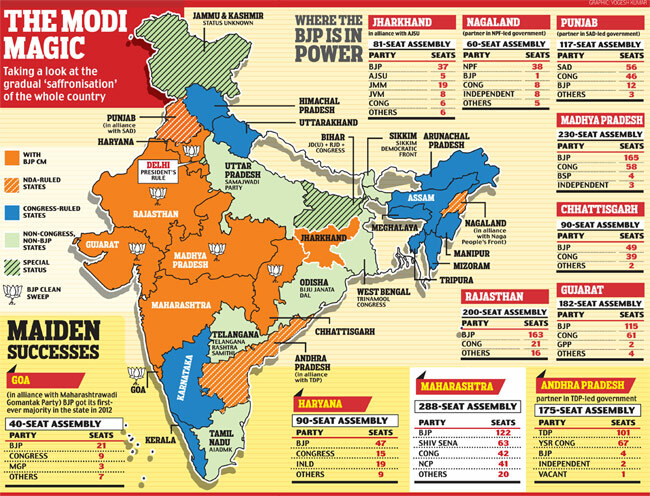 MUMBAI – MAHARASHTRA – INDIA FEBRUARY 04 , 2012 00.15 A.M. 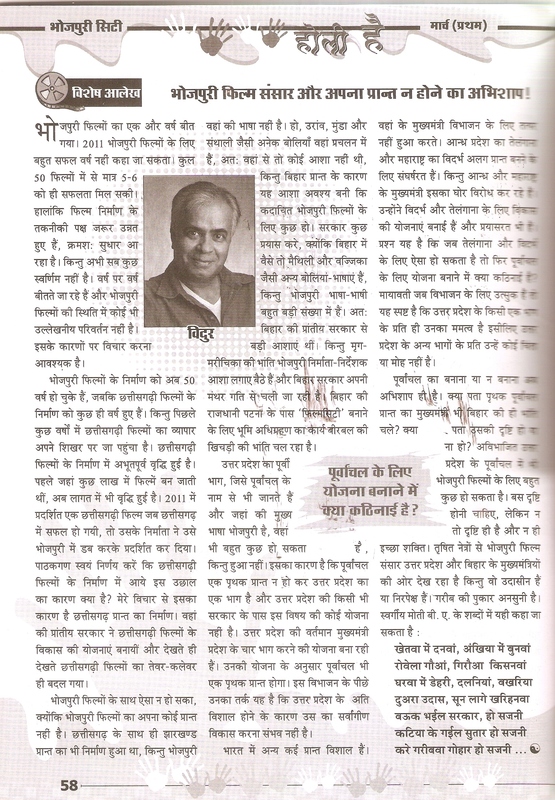 This is my 8th article for the fortnightly Hindi column , which I write in ” Bhojpuri City ” , a magazine being published from Mumbai . This is a trade magazine , dedicated to the Bhojpuri film industry . 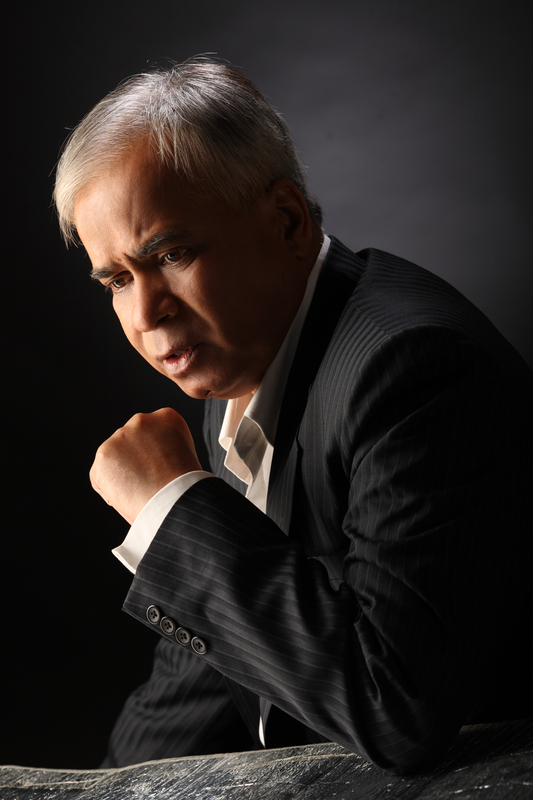 I was not able to write regularly but last time I promised to myself that I would be regular in future . So my 8th article comes close to my 7th article . 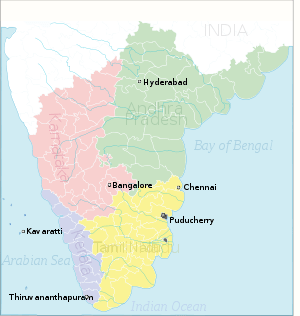 7th article came into the December 2nd issue of 2011 . 8th article is published in the latest , that is , February 1st issue of 2012 . 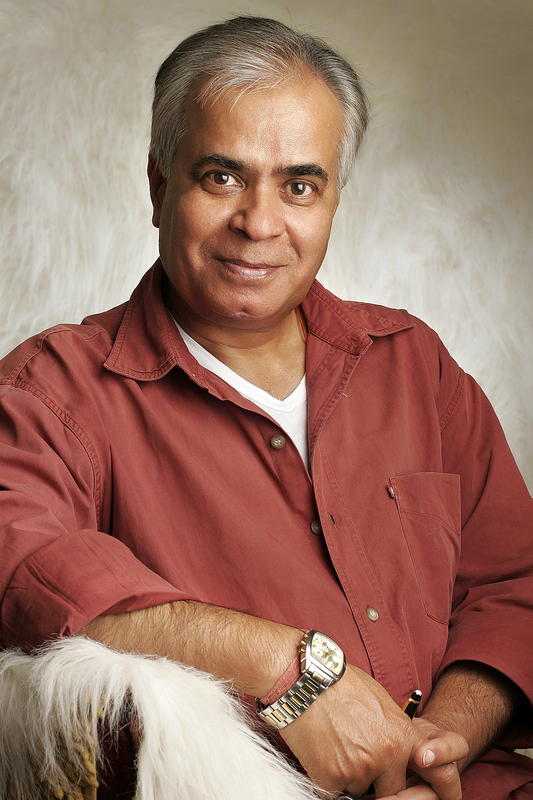 There was one issue of January 2012 in between but the editor decided not to publish my article in that issue because of the crunch of space . So my promise to be regular stands fulfilled . This article deals with the sad state of affair in the Bhojpuri film industry , which is plagued with mediocrity . 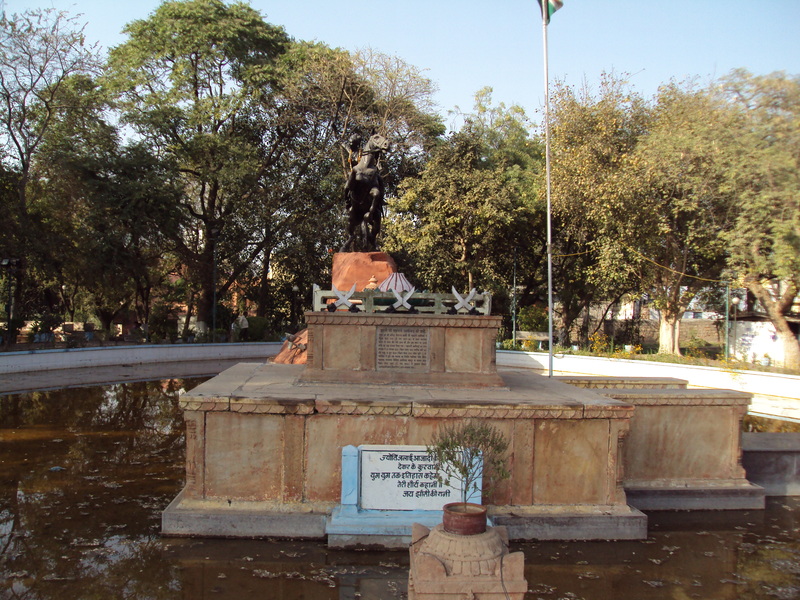 MUMBAI – MAHARASHTRA – INDIA MARCH 29 , 2011 11.45 P. M.
I am reproducing here the latest article of my fortnighly Hindi column, which comes in ” Bhojpuri City “ . 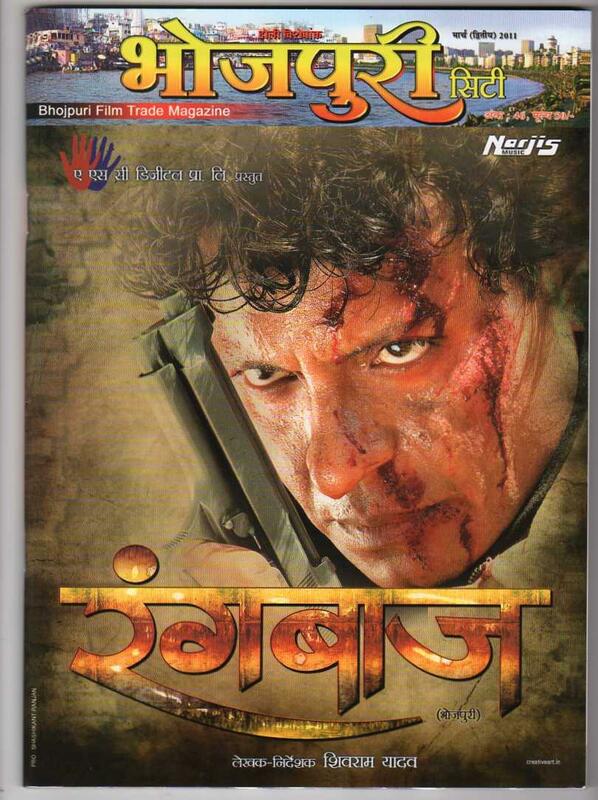 It is a Bhojpuri Film Trade magazine , which is being published from Mumbai. 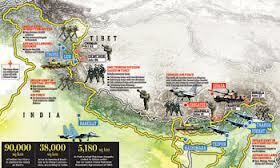 This article is the 4th in the series and it is published in the Holi edition of the said magazine. 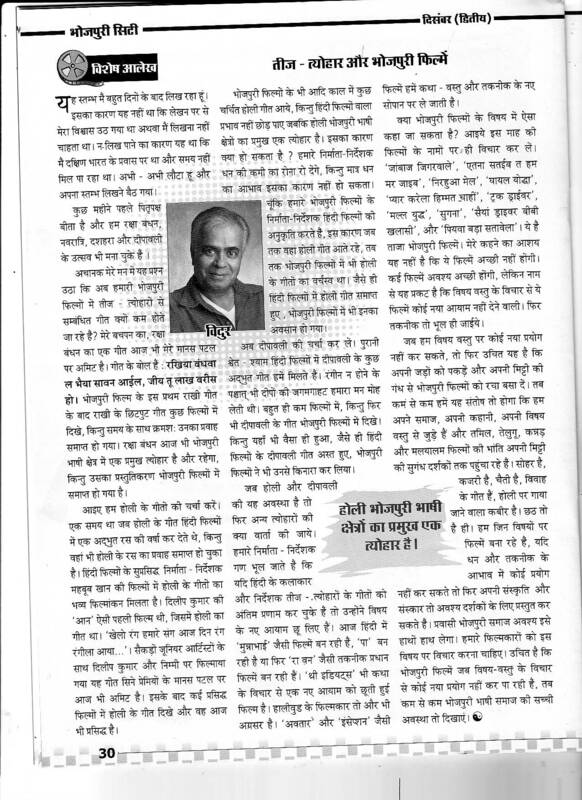 I am reproducing here my fortnightly Hindi column ” KAL AUR AAJ ” . 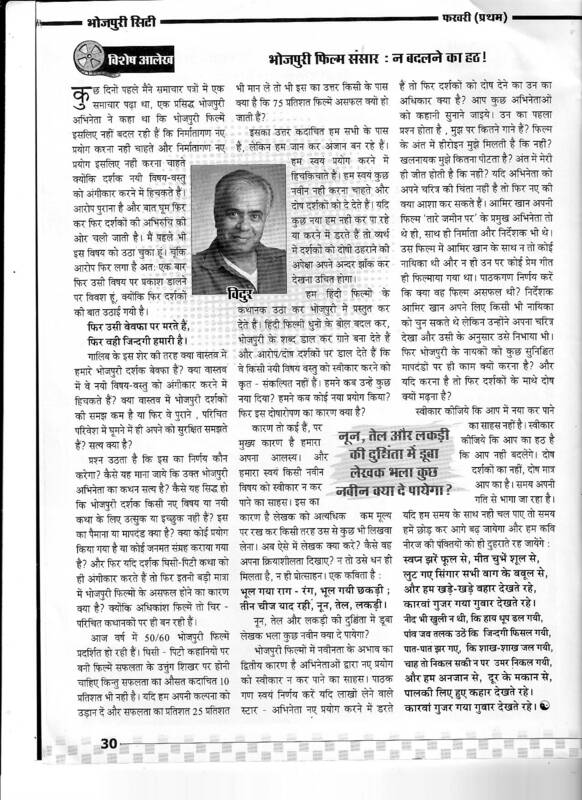 This is the third article of my first ever Hindi column . 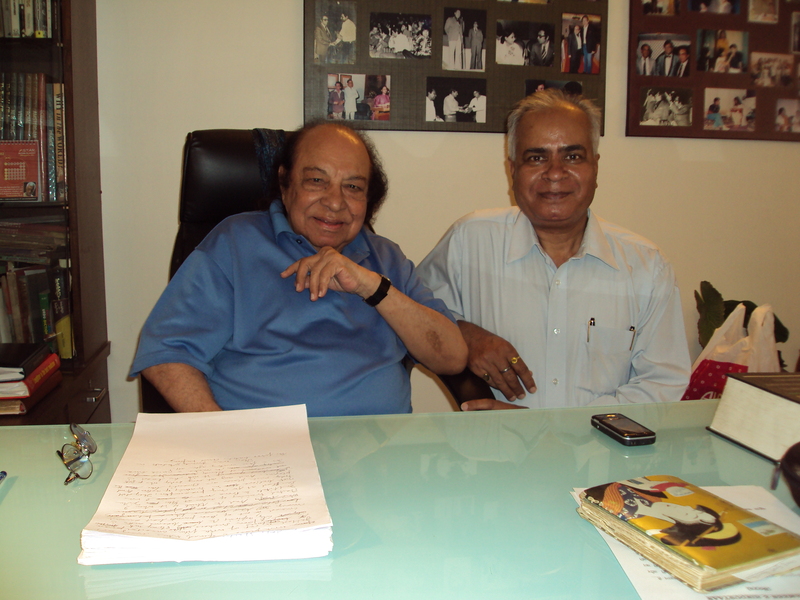 First article of the column was published in the December 1st, 2010 issue of Bhojpuri City. 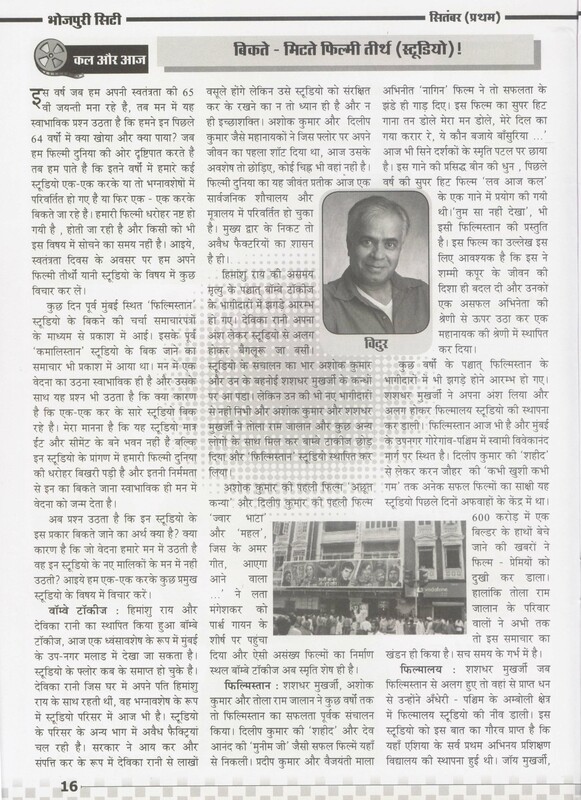 This third article of the column was published in the GOLDEN JUBILEE ISSUE [February 2nd & March 1st , 2011 ] of Bhojpuri City on the occasion of the golden jubilee of Bhojpuri cinema. It comes and will keep on coming in ” BHOJPURI CITY ” , a Bhojpuri Film Trade Magazine. This fortnightly magazine is published from Mumbai.